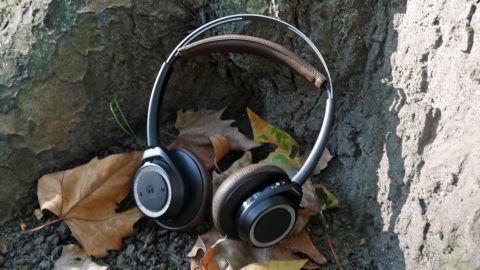 The Plantronics BackBeat Sense is a great-looking, lightweight over-ear offering that boasts brilliant Bluetooth connectivity - we just wish the sound was a touch more impressive. Plantronics isn't a manufacturer you would normally associate with headphones. It's a brand that made its name in the Bluetooth portable headset market. But making the jump from business-centric devices that perform a function to a consumer market where, increasingly, design is just as important as sound quality was always going to be a tough ask. This is Plantronics second stab at over-ear headphones. The first was 2014's Plantronics BackBeat Pro. While sound quality was exceptional it came with a few caveats: the headphones were bulky and heavy, really made for home or office use, and this also meant they were pricey. All of these niggles have been rectified in its latest headphones, the superb Plantronics BackBeat Sense. These wireless headphones not only look lovely, they are some of the lightest cans we have ever tested - weighing just 141g. They are seriously light which means that you can wear them pretty much all day without experiencing any pain or discomfort. They come with extra-comfortable padding, too. On the stainless steel headband, there is some super-soft leatherette material which is also used to cover the memory foam ear pads. It feels and looks great, doesn't warm up your ears like some other 'phones and there's definitely no pinching to be felt. There's also a nice design flourish in the ear pads - each one's sound holes have been shaped in either an L or an R to denote which way to wear the headphones. Attached to the headband is a pair of sturdy plastic arms that lead down to the circular controls on both the left and the right of the devices. The design of the controls will be familiar to anyone who has use a pair of Philips Fidelio headphones - this is no bad thing as it means that everything is well laid out and easy to use. On the back of the left ear cup, there's a rubber clickable button that has Play/Pause functionality in the middle and skip left and right along the sides. It is also on the left-hand side that the volume rocker is placed. there's a nub on the top that you flick forward to turn up the volume and back to reduce the audio. On the bottom is a red button which switches off the music and allows you to listen in to your surroundings. On the right ear cup, there is the power button and ability to take or cancel calls. Underneath is a 3.5mm jack for those that want to be tethered and a microUSB slot for charging. In the box you get a really nice carry case and a microUSB lead for charging the headphones, as well as some cable - jus in case you run out of battery. The Plantronics BackBeat Sense are wireless, which means you can attach them to a mobile device through Bluetooth. I found pairing to be really simple. I turned on the Bluetooth on my LG G4 - the phone I used to test the headphones - and pushed the on/off button to the top and held it there for a few seconds. When you do this, a female voice tells you through the headphones that it is trying to pair then it announces when your device is paired. You can have two things at once attached to the headphones, so if you are pairing your first device it will call it Phone 1. The headphones use Bluetooth v4.0 and just to show off its prowess in this area, Plantronics has made it so that the signal can reach up to 330 metres. That's 10x the normal range. My test of the Plantronics BackBeat Sense headphones has been over a number of weeks now and not once have I been disappointed with the sound. The first album I tried through the headphones was the most apt. Given Plantronics is well known for being the makers of the mic that Neal Armstrong muttered his infamous One Small Step speech into, when he became the first person to walk on the moon, I tried Public Service Broadcasting's The Race For Space. Go! was a track that really tested the BackBeat Sense. The bass offered up a crisp rumble, while the mid tones never sounded muddled. The tracks that tended to sound best were those that warranted a clean sound and weren't too bass driven. Mercury Rev's The Light In You sounded lush with great dynamic range but some bass-heavy Kendrick Lamar didn't have the bite that I was expecting. The sound is well-rounded, however, and it's nice to hear a pair of over-ear headphones that haven't been tuned primarily to drive bass. Volume was decent too, sounding much louder than many Bluetooth headphones we have tried - this has always been something of a bugbear with these types of headphones but the BackBeat Sense perform admirably. Some of this can be attributed to the addition of the aptX codec, with which the BackBeat Sense are compatible. It also makes sense that the Sense range acts as Bluetooth headset too. The calls we took were really clear, but I really wouldn't have expected anything less from a company that thrives in this area. There were a couple of niggles, though. While sound clarity was superb, these aren't as noise cancelling as their bedfellows. Wearing them on the ever-loud London commute - which for me is a walk, a bus, a train, a bus, a walk - outside noise was only really cut to about 50 per cent. The cans just didn't do enough to drown out the man apologising to his wife about forgetting her mother's birthday. On the flip side, though, noise leakage has been kept to a minimum - colleagues who sit by me couldn't hear any of the songs I was listening to, even on high volume. The good news is that they didn't hear the music when I took them off either, as the BackBeat Sense, er, senses when they aren't on your head and stops playing music. When you raise them to your ears the music begins again. It's a great touch and a feature I wish more headphone manufacturers would embrace. The biggest issue I had with the Plantronics BackBeat Sense was when walking with the headphones on. Because they are so light and the leatherette band acts as suspension for the headphones when you wear them, they do creak and offer up a slight pounding sound when your feet are hitting the pavement. Unfortunately there is definite touch-related noise as well, when you fumble for the controls. At first I thought this may have been an issue with my flat feet, but I gave the 'phones to a couple of my colleagues to try and they said they heard something similar. It hasn't stopped me wearing them but it is an issue - turning the volume up does mask it, though. Battery life was impressive throughout. Plantronics quotes 18 hours and I managed to squeeze around that per 2.5-hour charge. For some reason, the battery icon for the device, on my LG G4, never really looked much more than half full, though, which did irk me. But you can hard-press the right ear cup for an up-to-date tally of how the battery is going - five blue LEDs is the highest. When it comes to other stupid lights, I can tell you that there is no flashing light to indicate to the world that you are wearing Bluetooth headphones. I simply do not understand why others use that as an indicator - especially as I like to wear headphones at night, when a light like that looks like I am summoning planes and will wake a light-sleeping partner. Thank you for not including this, Plantronics! Plantronics isn't a big name in headphones but it should be. The Plantronics BackBeat Sense usher in a new era for the company. The design is sleek, offering a nice lack of bulkiness when worn. They are among the most comfortable headphones I have worn and the lightest of their type. The BackBeat Sense are simple to setup and while sound isn't perfect, for the price it is expansive and loud. If only Plantronics could do something about the audible sound you hear when walking with them on, then it would have a unbeatable range. For now, it is a fantastic, noticeably loud, step in the right direction for its headphones.